Thrash is heading to Texas Book Festival 2015! For reasons I cannot yet share, I was handed a copy of HONOR GIRL and dove right in late one evening. You know the story, you think you'll get in 30 minutes of reading before you fall asleep with your new read, BUT you end up devouring the book in one sitting. This is exactly what happened to me. I was immediately drawn in by the opening scenes when Maggie and Erin see each other years after the summer where the story takes place. Their encounter was awkward, and I needed to know why. An hour or so later, I closed the book. Then I reopened and read the last part again. This lead to about 30 minutes of contemplating Maggie's choices and playing her "what if" game. What if Maggie said something different, acted a different way? Would that change Maggie and Erin's relationship? And on and on. I was left feeling like I caught a special, very personal glimpse into a persons life. A game changing moment. Like mine, it was a unique coming out story. So very highly recommend! Drawing all day every day can feel very tedious and mind-numbing. I need something going on in the background so I don't wither and die from lack of stimulation. But it has to the right level of stimulation- it can't be, like, Melancholia or True Detective or a masterpiece. It's just gotta get your brain through the day. So here's the stuff I had in the background while I drew, inked, and painted all 260 pages of HONOR GIRL! "You live in a world of black and white, and I see pieces of gray. That's the difference between you and me. That's what made me fall in love with you, and that's what is tearing us apart!" Every episode of Dawson's Creek contains a little gem like this. These teens never stop with their improbable verbal dexterity, and ability to wring emotional crisis from every day situations. During long days of sitting alone at my desk, I rely on the Creek to bring drama to my existence. I love the dudes at Cracked. They are super cerebral, analytical guys who examine stuff like, "How Your Brain is Sabotaging You," and "How the PG13 Rating Took Over the World." I've been curating my Lord of the Rings Pandora station for four years now, and it is the perfect mix of the LOTR soundtrack, Enya, and harps. I don't like energetic music very much unless there's going to be dancing. When I'm at home and working, I can only tolerate spa music. I have a weirdly vast capacity for watching this movie. I watch it, like, once a week? It somehow never stops being rewarding. It's one of Tavi Gevinson's favorite movies. If I can't find anything else to watch, I'll put this on. I really like podcasts that analyze television. This one is my favorite. April Richardson watches every episode of Saved by the Bell and delves deep into the show's various lunacies. April's voice is great. Like me, he's from Atlanta, so her bro-ish Southern accent feels very reassuring and familiar. Room 237 is probably my all-time fave documentary; it explores wild conspiracy theories about the movie The Shining. I also really enjoy documentaries about how America is ruining the world. Surviving Progress, Hot Coffee, Blackfish, Fed Up, and Miss Representation are some good ones. Frasier is super easy to watch while you draw, because it's all talk. It's a quintessential 90's sit-com, which means there are only about three sets, and the characters choose from a basic menu of facial expressions. So you're not missing much by staring down at your desk while it's on. I borrow these from my Dad. They're lectures delivered by the world’s most knowledgeable professors. My favorites are The Story of Medieval England, which basically reads like a real-life Game of Thrones, and the history of language ones with Professor John McWhorter. Bad movie podcasts are fun because they give you an excuse to watch stuff that is basically junk food for your mind. You watch a terrible movie and then listen to a bunch of guys make fun of it. And since I'm working while I do it, I don't feel like I'm throwing my life entirely in the garbage. Dan Brown books are so dumb! You know Dan Brown, he's The Da Vinci Code guy. He also wrote about a dozen equally ludicrous books, and I've listened to them all. I always get sucked into the wild plots, and gain a strange joy from his maladroit sentences. "Physicist Leonardo Vetra smelled burning flesh, and he knew it was his own." Ouch! 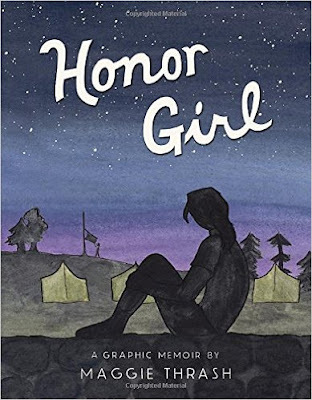 THREE lucky winners will win a copy of HONOR GIRL thanks to Candlewick Press! Fill out the fancy doo-hickey to be officially entered. US only, good luck!